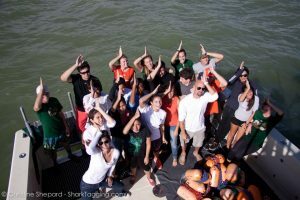 2013 was a great year for the University of Miami’s RJ Dunlap Marine Conservation Program, and we wanted to share some of the highlights with you! 1) We caught, measured, sampled and tagged 318 sharks, including 34 bull sharks, 23 lemon sharks,54 blacktip sharks, 35 tiger sharks, 20 great hammerheads, and even a great white! This included a successful expedition to tiger beach in the Bahamas. 19 tiger sharks, 3 scalloped hammerhead sharks, 7 great hammerheads, 8 bull sharks, and 1 blacktip shark were satellite tagged. Great white shark in the Florida Keys. 2) We took 1,584 people, of which well over 1,000 were high school students, out on the boat with us to learn about sharks and other marine science and conservation issues! 3) We published a paper about illegal shark fishing in the Galapagos. 4) We shared hundreds of marine science and conservation news stories on the RJD Facebook page, which now has over 3,000 fans! You should “like” us! 5) We published a paper about great white sharks scavenging on whales! You can see the video abstract here. 6) Using the RJ Dunlap twitter account (you should follow us), we held a twitter TeachIn about marine protected areas! This innovative teaching technique was profiled in Nature! 7) We published a paper about tiger shark feeding ecology and physiology! 8 ) We co-hosted ScienceOnline Oceans, a conference focusing on how marine scientists can use internet tools for education and collaboration! Several RJD staff, including two undergraduate interns, moderated sessions! 9) We published a paper showing how social media can help scientists to write papers! 10) RJD students and staff spoke about sharks in over a dozen local schools, as well as to schools all over the country via Skype. We spoke with over 500 students around the country, from 1st grade through college! RJD student David (in the back, wearing the awesome shark shirt) and Ms. Roche’s 5th grade class at Vineyards Elementary (Naples, FL) love sharks! 11) We published a paper showing how social media can benefit conservation scientists! 12) We welcomed the largest new group of interns in RJD history! 13) RJD students and staff presented at several scientific conferences, including Benthic Ecology, the American Elasmobranch Society, the International Congress for Conservation Biology, and ScienceOnline Together! Bonus: We partnered with Good World Games and the Guy Harvey Ocean Foundation to make Musingo, a music trivia app that helps the oceans! 2013 was a great year for the RJ Dunlap Marine Conservation Program, and we’re looking forward to an even better year in 2014! Thanks to all of our research collaborators, partners and donors! Thanks for reading, and Happy New Year! 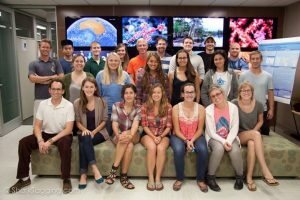 The RJ Dunlap Marine Conservation Program (RJD) is a joint initiative of the University of Miami’s Rosenstiel School of Marine & Atmospheric Science and Abess Center for Ecosystem Science and Policy. The mission of RJD is to advance ocean conservation and scientific literacy by conducting cutting edge scientific research and providing innovative and meaningful outreach opportunities for students through exhilarating hands-on research and virtual learning experiences in marine biology. Sounds like so much fun. Ccongratulations and thank you all for all of your hard work in making our ocean a better place. Great work guys and girls, thanks for sharing, keep it up during 2014! Your website’s Virtual Shark-Tagging Expedition was utilized to deliver educational content to sixth grade students participating in my pilot study on microblogging as a learning tool. 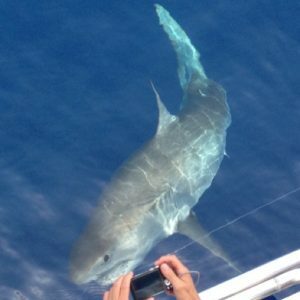 Efficacy of these two multi-media learning tools was demonstrated by students’ adoption of shark-tagging terminology and recognition of the relation between threats to shark populations and ocean conservation. The students are eager to join a real shark-tagging expedition when they reach high school.